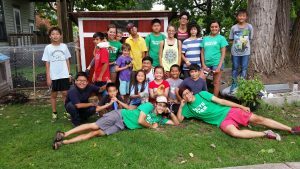 As we gear up for our 22nd summer, we at Youth Farm want to take a moment to reintroduce and acknowledge our staff that dedicate so much time, expertise, and passion to the youth and families in our Youth Farm neighborhoods. Meet Director of St. Paul Programs Sarah Sarzoza and Director of South Minneapolis Programs Phil Rooney! Phil is entering his 10th summer with Youth Farm. 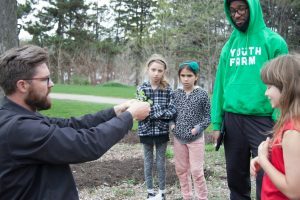 He began his work with Youth Farm on the West Side and served as the Lyndale Program Director for 6 years prior to becoming Director of South Minneapolis Programs. In addition to his experience at Youth Farm, Phil brings with him strong leadership and youth development experience. In his role as Director of South Minneapolis Programs, Phil is the first point of contact for families and community partners in our Powderhorn and Lyndale Neighborhoods. Additionally, his role will focus on leadership development and training in both Powderhorn and Lyndale. Learn more about Phil and how to contact him here. We are honored that Phil and Sarah choose to share their talents with Youth Farm and are excited to have their leadership. Look for them throughout their Youth Farm neighborhoods next week as we start our summer program! Sarah and the Frogtown crew relax (with some chickens!) after a day of farm work. You are doing amazing work! Previous PostPrevious Thank You Amm-Ra! Next PostNext Welcome Hawthorne Farm Stewards!